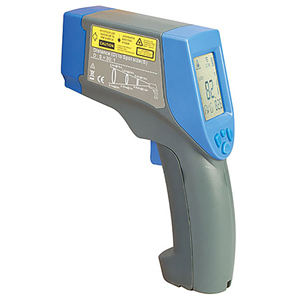 The OS423-LS is a fully functional infrared non-contact temperature measuring device. Offered at an economical price, the OS423-LS offers laser sighting, several mathematical modes, and adjustable emissivity. Long battery life, (typical 180 hrs without laser or backlight), is obtained from 2 “AAA” batteries (included) along with automatic shut-off. The 8-14 µm wavelength sensitivity rejects spurious reflections from local lighting. 참고: Comes complete with hard carrying case, 2 “AAA” alkaline batteries, Type K thermocouple and operator’s manual.